Which company would not like to get significantly improved insights into the market with detailed data and thus optimize its products and services? In most cases, the corresponding data is already available, but its use is often restricted for data protection reasons. Anonymization is used when you want to use a data set with sensitive information for analysis without compromising the privacy of the user. Moreover, the principles of data protection do not apply to anonymized data. This means that this information can be analysed without risk. Therefore, anonymization is an enormously helpful tool for drawing conclusions, for example, from bank transaction data or patient medical records. In practice, however, things are less simple: Data records in companies are often anonymized manually. Although special anonymization tools or anonymization software are used, many parameters in the corresponding tools must first be determined by experts and then entered manually. This process is laborious, time-consuming, error-prone and can usually only be handled by experts. At the same time, one must choose the lowest possible level of anonymization, which nevertheless reliably protects the data. Whenever information is removed, the quality of the data record deteriorates accordingly. Due to the data quality problem, data records in companies are often only supposedly anonymized when they are actually pseudonymised. Pseudonymisation means that personal identification features are replaced by other unique features. This often enables attackers to re-identify the pseudonymised data set with the help of external information (Your Apps Know Where You Were Last Night, and They’re Not Keeping It Secret, NYTimes). For example, pseudonymised data records can be combined with additional information from third-party sources to make re-identification possible (linkability). Likewise, the enrichment of data records classified “unproblematic” can lead to the exposure of sensitive data when you cross-reference it with additional information. Netflix is one company that has had to struggle with such a case: In a public competition, they sought a new algorithm for improved film recommendations. A database with Netflix customers was anonymized and published. However, researchers were able to link it with data from IMDB rankings and thus de-anonymize the users. The list of attributes that must be anonymized (data protection/privacy) and the utility of the data must both be precisely defined. In order to ensure the latter, it is crucial to understand the use case for the anonymized data set in detail at this point, because this may better preserve the information quality of the decisive dimensions by accepting a restriction for other, less decisive, data. Data is often only pseudonymised. Attackers can thus draw conclusions from the data records by linking them with other information. The website of the ARX Anonymization Tool gives a list of further anonymization software that works according to the static principle. 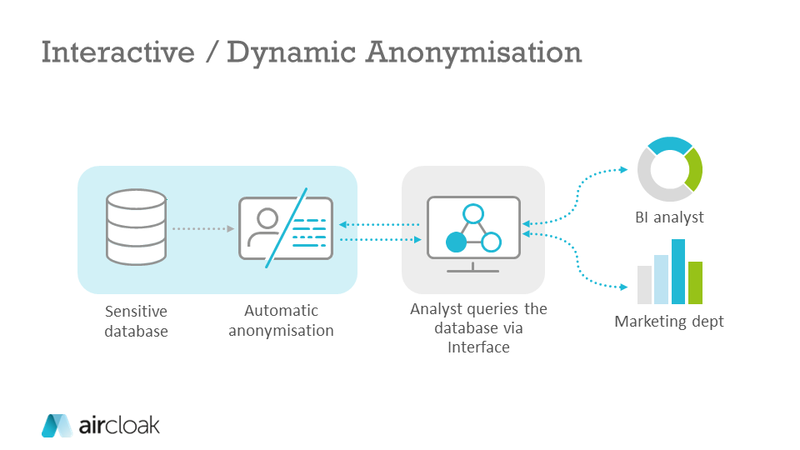 With interactive anonymization, anonymization is applied dynamically to the results of a query and not to the entire data set (that’s why we call this procedure “dynamic anonymization” at Aircloak). The analyst can access a database via an interface and make queries. The anonymization happens automatically during the query and he receives only anonymized results. This dynamic approach is used for Differential Privacy as well as for Aircloak. Since the results of the queries are changed by noise addition, the number of queries must be limited, at least for differential privacy. Otherwise, it would be possible for attackers to calculate the noise by using simple statistical methods and thus de-anonymize the data set. Aircloak avoids the need of a privacy budget by adding noise tailored to the queries with the framework Diffix. The great advantage of interactive anonymization is that the anonymization is performed automatically and the analyst does not need to have any knowledge of data protection or data anonymization. This allows the analyst to fully concentrate on evaluating the data. Some experts have the opinion that interactive anonymization tools protect privacy better than non-interactive tools. “Another lesson is that an interactive, query-based approach is generally superior from the privacy perspective to the “release-and-forget” approach”. The probability of poorly anonymized data sets is much higher with static anonymization due to the very complex selection of data usability/data protection parameters. 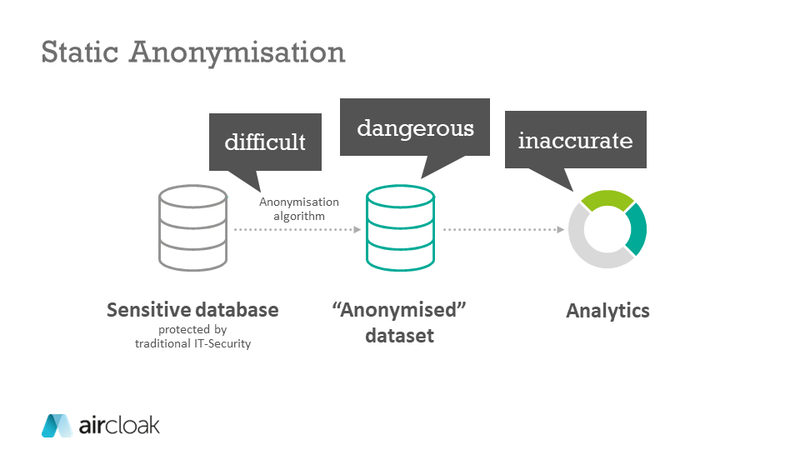 Nevertheless, static anonymization is often sufficient in one-off projects with clearly defined frameworks, preferably in conjunction with further organisational measures. Dynamic anonymization is particularly suitable in larger projects and with regular use of anonymized data records, where uniform processes and data protection compliance are the highest priority. Ultimately, it always depends on the use case and on how important the privacy of the data is. “Interactive anonymization” is not clearly defined. For example, the research paper Interactive Anonymization for Privacy aware Machine Learning describes how an interactive machine learning algorithm interacts with the help of an external “oracle” (e.g., a data protection expert) that evaluates the result of the anonymization performed by an algorithm and thus makes continuous improvement possible. By contrast, the Cornell Anonymization Toolkit claims that it is “designed for interactively anonymizing published datasets to limit identification disclosure of records under various attacker models”. However, the interactivity here is limited to the fact that the anonymization parameters can be adjusted in the tool. The result is nevertheless a statically anonymous data set.